Logan Rufenacht of Pettisville scores ahead of teammate Austin Horning in a game versus Fayette this season. Rufenacht made second team all-league for the Blackbirds while Horning was honorable mention. 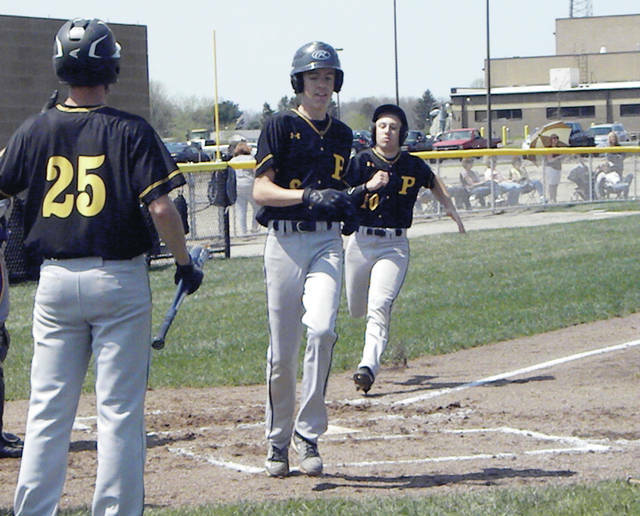 The Buckeye Border Conference recently made their all-league baseball selections with the area being well represented. Being named first team all-league was Landon Roth of Pettisville. The player of the year in the league was Dakota Benner of Montpelier. Second team All-BBC for Pettisville was Logan Rufenacht. Also making the second team was Tanner Wagner of Fayette. Jack Blaisdell, sr., Hilltop; Tyler Suboski, sr., Hilltop; Blake Altaffer, fr., Montpelier; Bryer Bentley, jr., Montpelier; Colton Schmunk, jr., North Central; Landon Roth, sr., Pettisville; Logan Boetz, jr., Stryker; Daryke Bass, jr., Edon; Austin Kiess, soph., Edon. Player of the Year- Dakota Benner, jr., Montpelier. Christian McKinney, soph., Hilltop; Jay Garrett, soph., Hilltop; Josh Bailey, sr., North Central; Layne Cogswell, jr., North Central; Logan Rufenacht, jr., Pettisville; Luke Holsopple, jr., Stryker; Kristian Grapengeter, sr., Stryker; Izayah Ferguson, jr., Stryker; Carson Brandt, sr., Edon; Tanner Wagner, fr., Fayette. Fayette: Trevor McClain, Travis Wagner, Porter Maginn. Pettisville: Dillon King, Austin Horning.